Stay home and enjoy this restaurant quality soup. 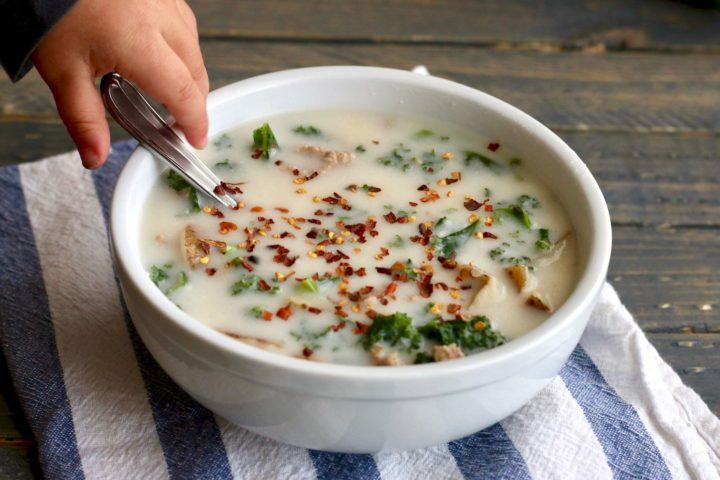 My Better for You Zuppa Toscana is made with lean ground pork (or turkey), sausage seasonings, garlic, potatoes, and kale all simmered in chicken broth with a splash of fat-free half & half added when you serve it. This version is guaranteed to be a crowd-pleaser. No stretchy pants required! Zuppa Toscana is that soup made famous by the Olive Garden. It is full of spicy sausage, bacon, and cream. My version is better for you than the restaurant’s version. It is also GLUTEN FREE since I skipped the roux and use cornstarch as my thickener. 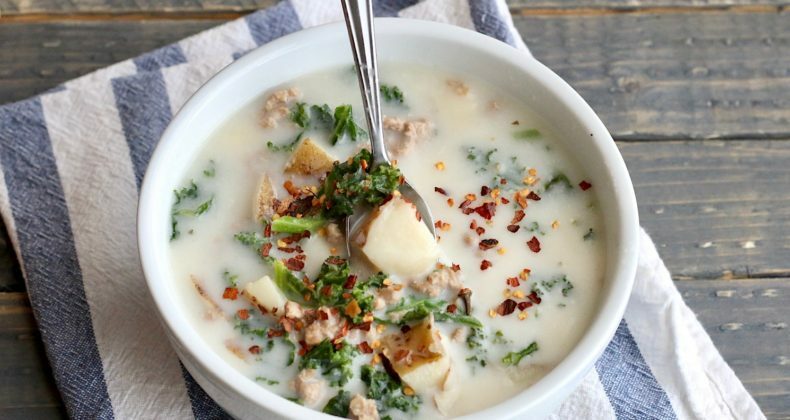 You can eat endless bowls of this Better for You Zuppa Toscana and not feel weighed down. 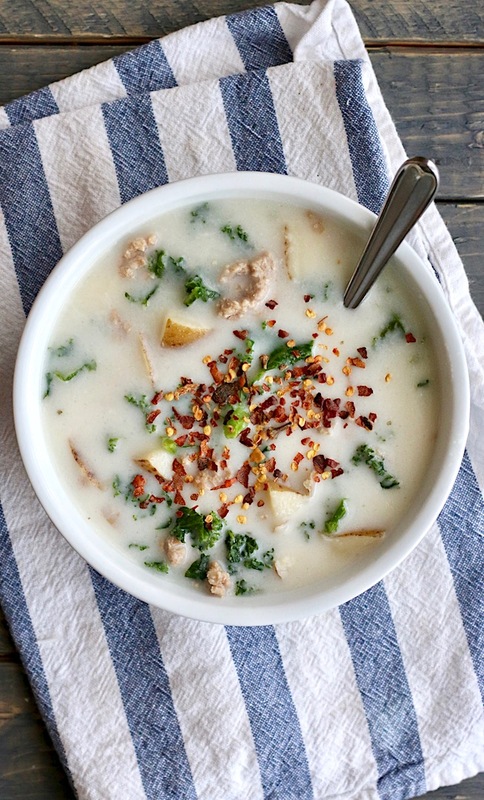 I love that soup season is here and look forward to cooking up endless batches of this Better for You Zuppa Toscana this winter. A few years ago I developed a slow cooker Pork Zuppa for Diabetic Living Magazine. Most of the cooking is done in the slow cooker while you are away at work and is a great healthy alternative to the original. This new and updated version I cook on the stove top and have made it even lighter by using a splash of fat-free half & half right when you serve it. I promise you won’t miss the cream. You have some options when it comes to the soup. You can make it as healthy as you want it to be. If spicy sausage, bacon, and cream are your thing then you be you and do it. If cutting some caloric corners this winter is what you’re looking for then let me be your guide. You can use ground pork or ground chicken/turkey and combine the meat with traditional sausage seasonings like fennel, marjoram, sage, and oregano to fake the sausage flavor. Instead of a cup of heavy cream opt for the splash of the fat-free half & half. Add a pinch or two of red pepper flake to your bowl of soup at the end and your children or family avoiding spicy foods will be thankful you left it out of the giant pot. So what are you waiting for? Let’s get eating. What sort of restaurant foods do you want to recreate at home? Leave me a comment and I will try my hardest to develop a recipe for you! Yummy! Looks and sounds perfect, this is my hubby’s favorite soup at OG! Ooo how have I not tried this at Olive Garden? It sounds fabulous! I’ll be making this soon! When does the kale go in?? Step 6 says to stir in the kale. I like mine just wilted by the heat of the soup.